You bought a super cute Dachshund fleece coat or sweater but, unfortunately, it doesn’t fit. It’s disappointing. I get it. It’s difficult to find clothes for a Dachshund that don’t end up looking like a midriff shirt because it only covers half way down their body. When shopping for a fleece coat for your Dachshund, I’m assuming you are looking for something to keep them warm. If the jacket doesn’t even cover their whole back, how can it do that? Since cold weather is upon us, I thought I would share some jackets that actually fit. These are always in our dog jacket dresser (yes, I have a small dresser for Gretel and Summit’s coats… and they don’t all fit in there!). 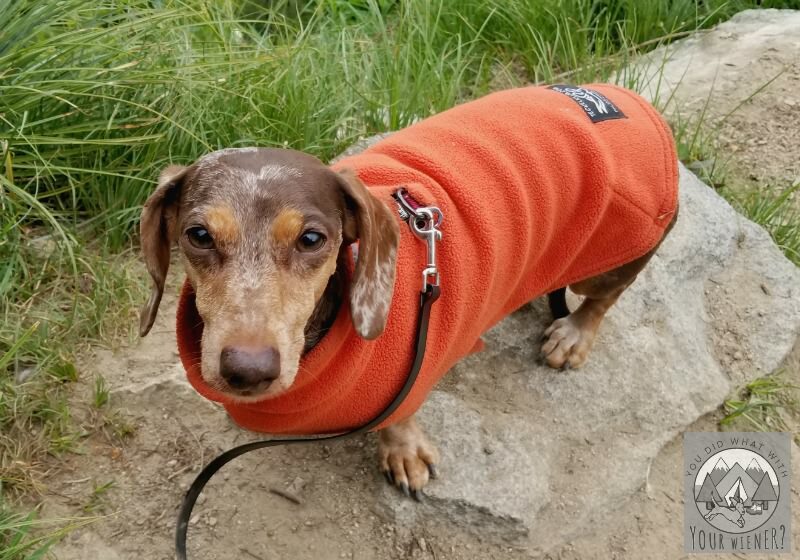 Where Can I Find a Dachshund Fleece Coat That Fits? Luckily, there are fleece coats made specifically for a Dachshund’s long body. I think the best ones are made by Teckelklub. They fit well, are high quality, and affordable. They’re made with anti-pill fleece, strong Velcro closures, and hold up well to multiple washings. Teckelklub makes several styles of fleece coats good for different situations and temperatures. 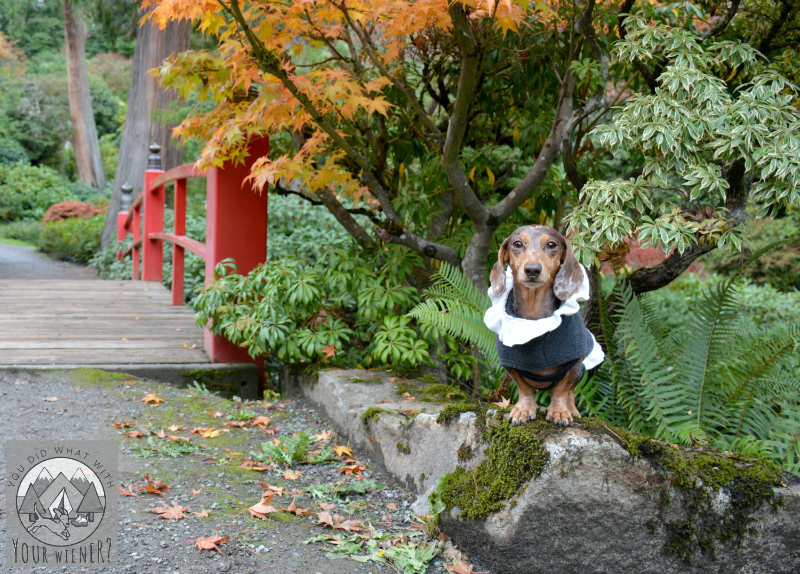 For slightly chilly evenings or mornings, your Dachshund may need a light layer to help keep them warm. The Teckelklub Fuzzie fleece dog coat is great for that. This cozy jacket is made with 420 weight anti-pill Polyester fleece and has a reflective band on the collar for visibility in low-light. The right size will reach all of the way down your Dachshund’s back to the base of their tail, or at least within an inch of it. This jacket doesn’t have Velcro at the neck but it’s quick and easy to slip over your dog’s head. It does have an under-belly Velcro closure for ease of use and adjustability. It’s soft, machine-washable, and comes in over 10 stylish colors to coordinate with almost any dog leash, collar, or harness. I like having several different colors to match our mood and accessories. Personally, I can’t decide if I think Gretel looks better in guard red, foxy orange, grape purple, or apple green. 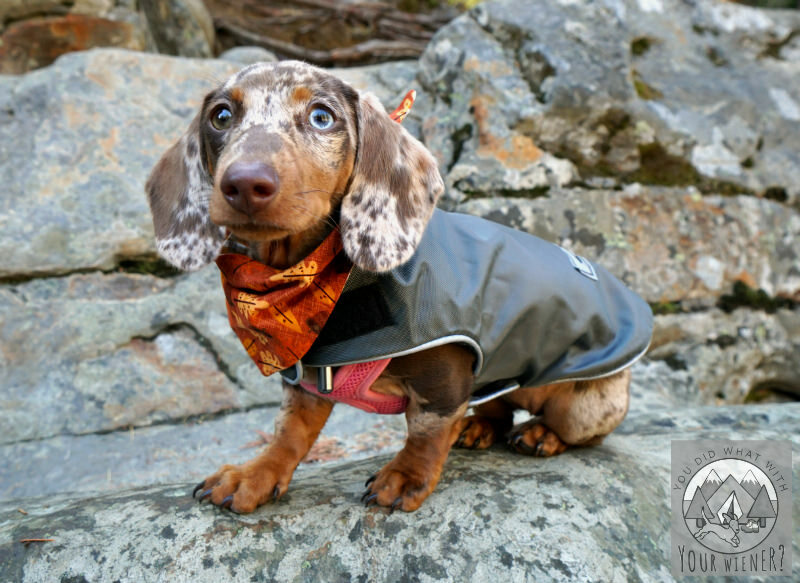 The Fuzzie fleece dog coat is available in sizes 6” through 28” to fit any sized Dachshund, whether you have a miniature, standard, or tweenie. 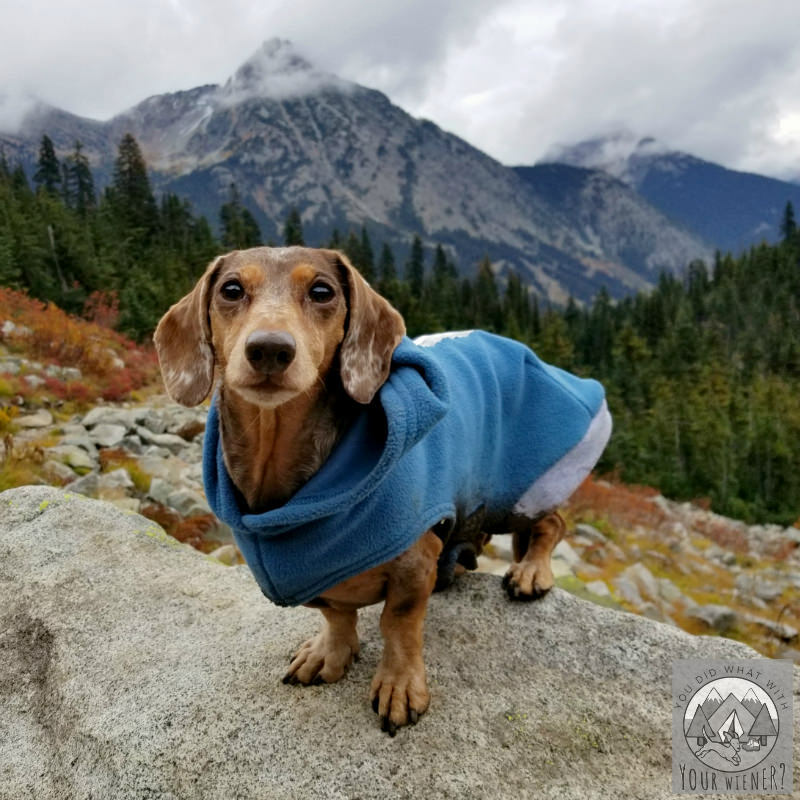 The Luxy Fleece Dog Coat is a great alternative to the Fuzzie for girl Dachshunds or a dog that wants a little extra flair in their wardrobe. It’s very similar to the Fuzzie except it has a fleece ruffle around the neck and rear end. I think it makes Gretel look like wiener dog royalty or a girl from the Shakespearean or Victoria era. She often gets attention wherever we go but people especially love to admire her when she’s wearing this fleece jacket. If you need a fleece jacket for your Dachshund that is thicker and warmer, the Teckelklub Bunnyhug is the one you want. Compared to the Fuzzie, it feels like a double weight fleece. 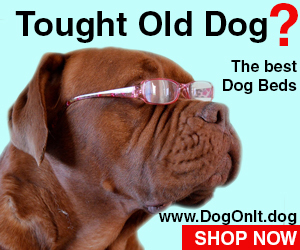 It’s “huggable” comfort keeps the warmth in by covering, and wrapping around, your dog’s bum. It’s has a longer back than the Fuzzie above, and some pin tucking, so it curves around their body to create a little cocoon of warmth. It comes in a couple of different colors, is machine washable, and has a 2” wide 3M™ reflective strip down the back (I like to think of it as a racing stripe. Ha, ha) to help keep your dog visible and safe on walks. It’s 100% windproof and breathable. The Bunnyhug also utilizes high quality anti-pill fleece and will retain its shape and style for years of use even with regular washing. It rains a lot where we live in Seattle. Since, like most Dachshunds, mine are susceptible to Wet Belly Syndrome (spoof illness) we often need a fleece coat that is also waterproof. The Teckelklub Winter Trench is basically the Fuzzie with a 100% waterproof, but highly breathable, layer on top. This outer shell helps cut any wind chill while keeping your pup dry. It’s available in a variety of colors and features a 3M™ brand silver reflective piping on all edges of the jacket for 360 degree visibility. 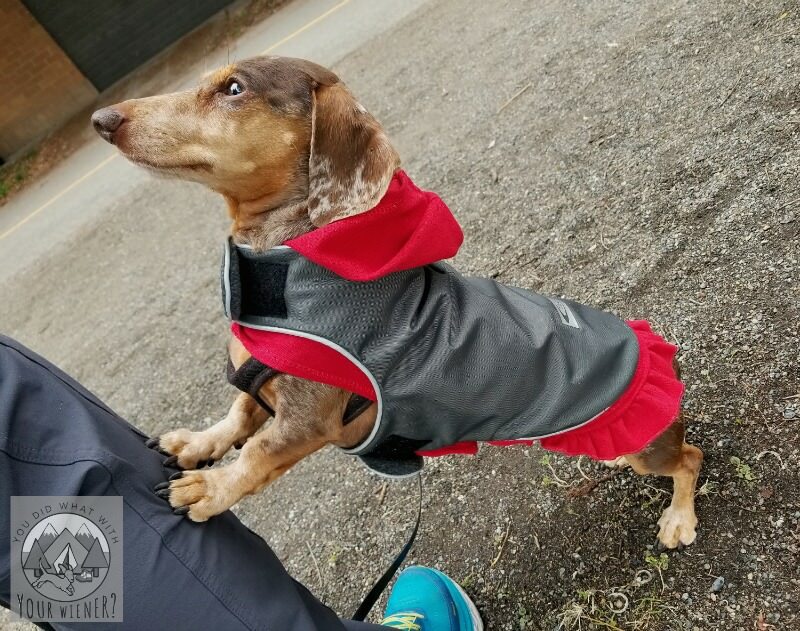 If your Dachshund needs extra warmth, this waterproof fleece dog coat is easy to layer over the Fuzzie or Luxy fleece jackets for a double layer of protection. It’s fun to mix and match the colors, choosing a Fuzzie and Trench that match or by choosing to layer a fun color under the outer jacket. This picture actually shows the Sweet Dog Hoodie under the Trench but it’s basically the Luxy with a hood and made from anti-pill knit cotton fabric. The Luxy would look the same under the waterproof fleece trench minus the hood. As an added bonus, with the Fuzzie layered underneath the Trench, I find that Gretel’s belly stays a little dryer and cleaner when we walk on wet streets or muddy trails. If you need a waterproof fleece jacket with a harness hole, buy the Sierra Coat instead. 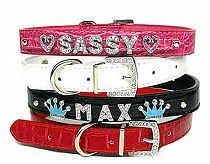 It has the same styling as the Trench with the addition of a waterproof covered leash opening. The fleece dog coats listed here will cover your dog in about any weather situation (pun intended). 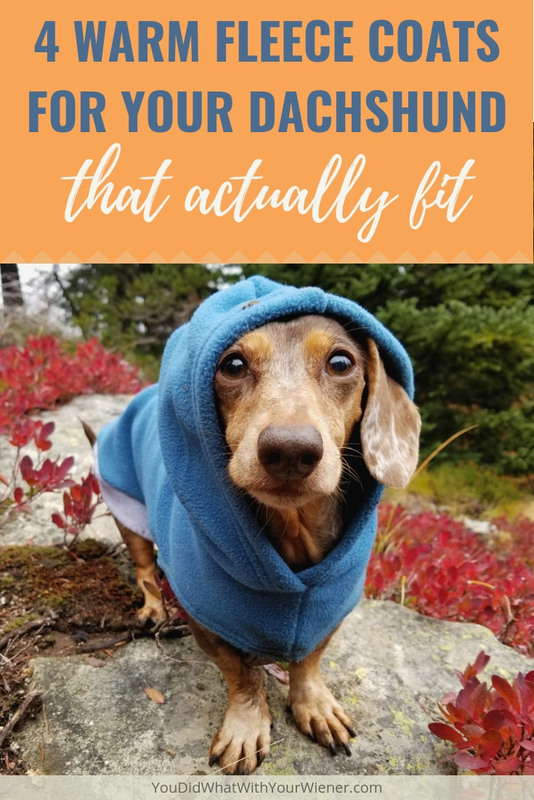 If you’re not sure your dog needs to wear clothes, check out my article on how to tell if your dog needs a jacket in the cold. Note: Teckelklub sent me all of the jackets above so we could try them and share our thoughts with you. Even though these were sent “in exchange for a review”, I always share my honest opinion about things (or don’t share them at all if they are crappy).